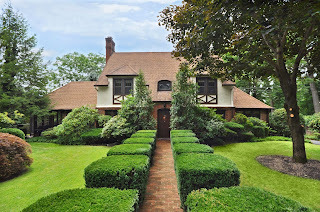 There’s just something about Tudor homes that makes my buyers fall in love instantly. They’re the perfect combination of vintage charm and informal coziness and we’re lucky enough to have a lot of them in this area! Lake Arrowhead in Denville is home to a bumper crop of little fairy godmother cottages and the Boonton Park Section boasts many larger-scale representatives of the style. One thing is for sure – whether they’re big or small, you’re going to be enchanted! 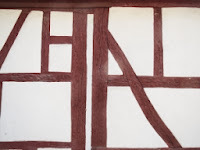 In case you’re wondering what makes a home a Tudor, it’s all about the materials. The most popular feature is half-timbering. Stucco divided by beams gives these homes the look of an old English cottage. You’ll often see decorative brickwork – whether it’s in an elegant herringbone pattern or made up of irregular “clinker” bricks for a rustic touch. Fieldstone is popular in the foundations or for chimneys. 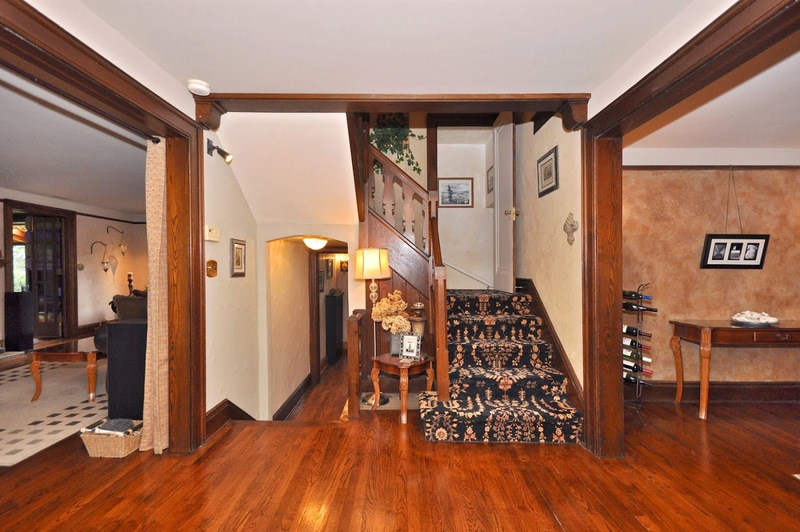 An inviting entry with an arched board and batten door and strap hinges is also a common highlight of Tudor homes. And the warmth of these homes isn’t just in your head. Fireplaces give friends and family a hearth to gather around all Winter long. 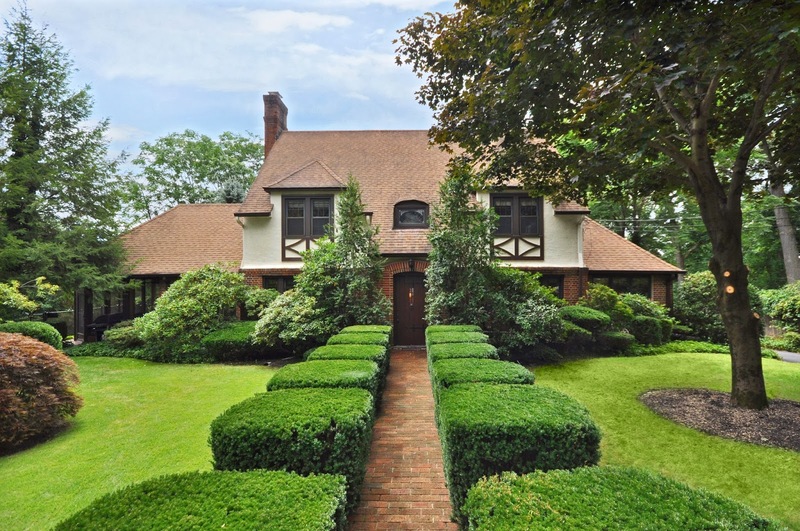 One of the most stunning examples of Tudor architecture I’ve seen is my listing at 140 Ridgeview Place in Boonton’s gracious Park Section. This home is a perfect example of how you can enjoy the fairy tale feel of a Tudor without compromising on modern amenities and luxuries. Discard the cares of the world as you walk down a hedge lined brick pathway and enter through the charming strap-hinged wood door of this enchanting Tudor home. Decoratively laid slate flooring and an archway welcome you into the inviting Foyer, which offers chestnut trimmed entryways to the Living Room and Dining Room and an elegant staircase with fancifully carved balusters and a chamfered rail. Throughout the home, you’ll find glazed Venetian plaster walls, original chestnut trimmed doorways and window casings, deep baseboard moldings and picture rail trim. The Living Room offers two walls of divided light casement windows, gleaming hardwood floor and a handcrafted fireplace surround featuring ornamental tilework and a stunning wood mantelpiece. Two sets of French doors lead from the Living Room to the Family Room, which offers parquet flooring, built-in shelves and opens to a sun-filled meditation space featuring skylights, walls of windows and a terra cotta tiled floor. 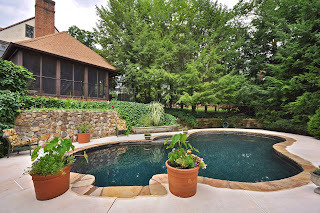 From the Family Room, enter a screened Sun Room featuring brick floor, pine paneled walls and ceiling, access to the yard and calming views of the pool and koi pond. 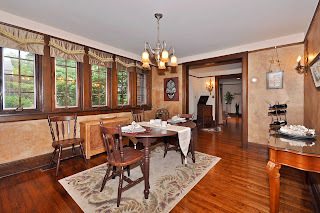 The Formal Dining Room is ideal for entertaining & bathed in light by a row of casement windows. A Den off of the Dining Room offers an informal space to unwind, with parquet floor, walls of windows and a built-in bar tidily tucked into a closet. 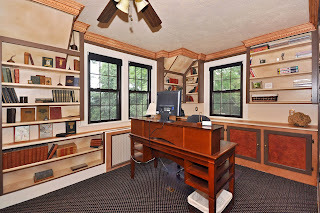 Stepping down from the Foyer, enter the Study, which offers dramatic high ceilings, hardwood floor, closet and access to a well appointed Half Bath. 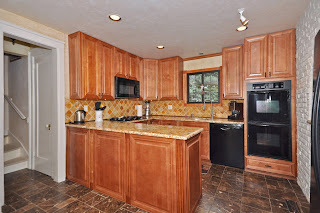 The Kitchen is both beautiful and functional, with custom wood cabinets, granite countertops, tumbled stone backsplash, Bosch dishwasher, double wall oven, cooktop, built-in microwave and a brick accent wall with a decorative arched inset & shelving. The Kitchen also offers a large pantry and access to a back entrance featuring extensive built-in storage – including anti-tarnish lined silver drawers and vertical storage for cookie sheets and cooling racks. On the Second Floor, enter the Master Bedroom through its bright and spacious Dressing area, which offers ample custom shelving and storage and an ideal airy space to get ready for your day. 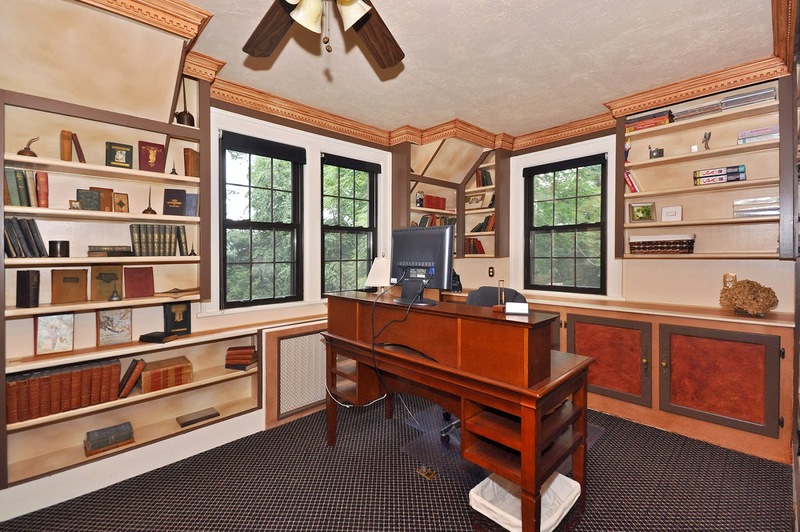 The Master Bedroom features wall-to-wall carpet & stunning year-round views. The luxury Master Bath is beautifully outfitted, with a granite topped double vanity, built-in shelving and a stall shower with glass tile accented walls, granite shower seat and rainfall shower head. The Second Bedroom offers built-in dressers & access to two large cedar-lined closets. 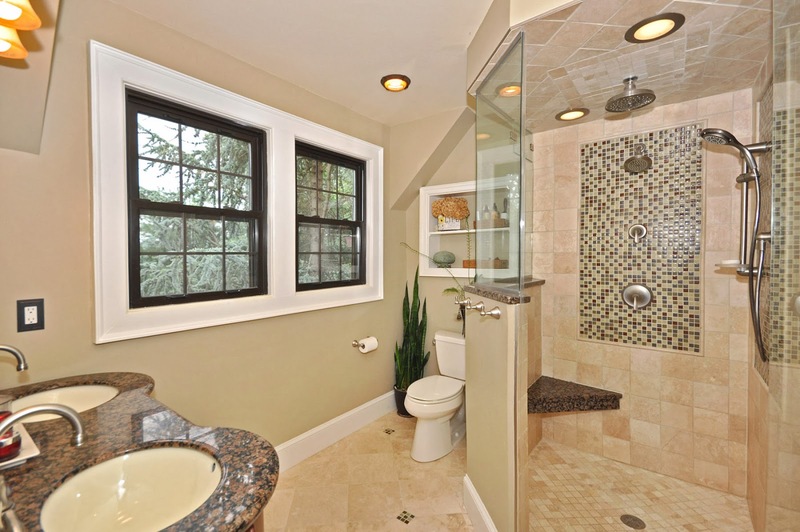 The Hall Bath offers elegant tilework and an arched inset with stained glass window. The Library is lined with shelves and counterspace and offers a third cedar-lined closet, a recessed panel accent wall and crown molding with dentil trim. The Third Floor features two additional Bedrooms with abundant storage and charmingly angled ceilings, as well as a Full Bath with clawfoot tub. The Finished Basement features amazing storage and workshop space as well as a Laundry Room with sink and a Full Bath with stall shower. The property provides a private oasis for relaxing and entertaining. The heated Gunite pool features a separate spa and is fully fenced for safety. A roomy storage shed is discreetly concealed behind evergreens. Steps lead down through a beautifully landscaped, sprinkler maintained yard to a private outdoor space perfect for a sitting area or playset. 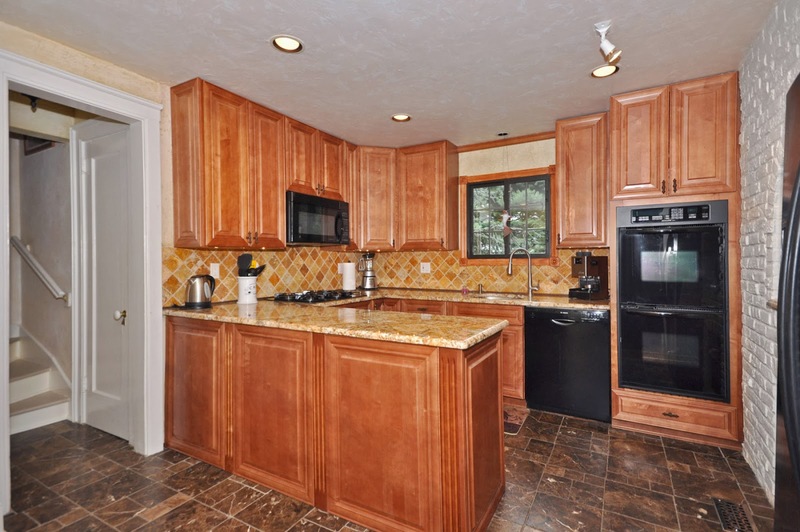 The whole property is encircled by evergreens for year-round color and a feeling of complete peace and privacy. 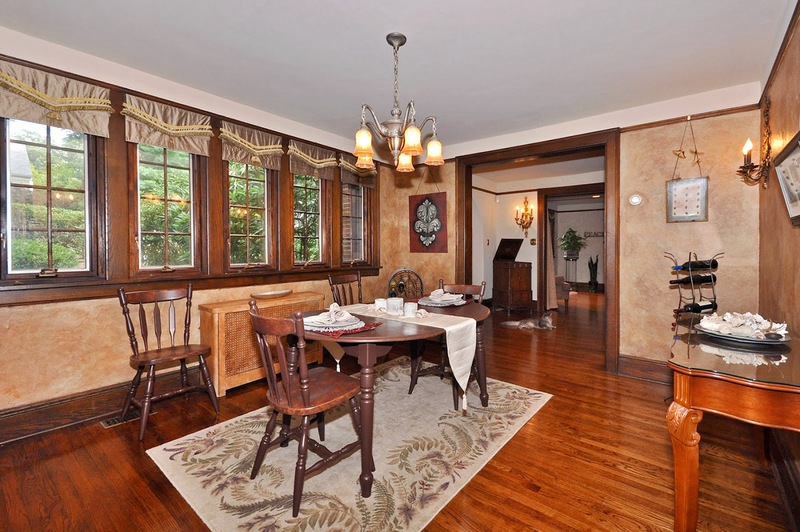 This home is truly one of the crowning jewels of Boonton’s Park Section.